Posted on 15 May 2016. 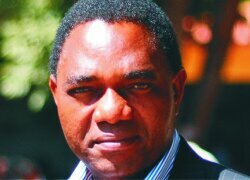 HAKAINDE Hichilema should be arrested for threatening the Electoral Commission of Zambia (ECZ) and the peace of the country, Patriotic Front (PF) secretary general Davis Chama has suggested. On Friday, Mr Hichilema warned the ECZ not to settle for Algurair Printing and Publishing House, a Dubai-based printing company, to print ballot papers for the August 11 general elections as his party would not be responsible for what might happen to the country. Meanwhile, ECZ public relations manager Cris Akufuna said the commission was still doing the review following the objection of its intent to print the ballot papers in Dubai. “We are still in the process of selecting a bidder to print the ballot papers and when we are done, we shall inform the nation which company will be selected,” Mr Akufuna said. But Chama has warned that both the State and Zambians would severely deal with Mr Hichilema should his party intend to disrupt the general elections following his threats on ECZ and national peace. Mr Chama said Mr Hichilema was not above the law as he was just like any other Zambians who should be arrested for threatening the peace of the country. Meanwhile, Mr Chama has warned the UPND leaders against talking down people because Zambians would not allow him to do anything should ECZ decide to print ballot papers in Dubai or any other country. “If he wants to disturb the peace which Zambia has enjoyed for the past 50 years, we shall not allow him to do so…UPND cannot threaten ECZ,” Mr Chama said. He told Sunday Nation that Mr Hichilema would be dealt with severely if he attempted to disturb the peace which Zambians have enjoyed over the years. “In fact, I want to put this on recording and I repeat HH will be dealt with severely by the State and Zambians should he attempt to disrupt peace. He will have no place to run to and where to hide,” he said. Mr Chama further extended the caution to all the youths who HH and his vice-president for Administration Geoffrey Bwalya Mwamba had been using and probably intending to use to disturb the peace of the country to desist from such acts. Mr Chama wondered why Mr Hichilema and GBM had been using abusive language and promoting violence despite having attended a meeting convened by the church mother bodies which discouraged violence and abusive language. He reminded Mr Hichilema and the UPND that the new law on ECZ electoral process criminalised baseless threats on the electoral body. Mr Chama said once approved by the President, the Bill on Election process would criminalise statements such as the one which Mr Hichilema issued on Friday during their press briefing. “In fact, it is criminal because in the new Constitution ECZ is an autonomous body which should operate independently. The law enforcement agents should be on him and question him why he is issuing threats on ECZ and the peace of this country,” Mr Chama said. He said the ballot papers would be printed from the country of ECZ’s choice and no one should disturb them for doing their work. “I dare him to continue issuing threats and do whatever he wants. The law will surely catch up with him,” he said. Mr Hichilema was quoted as having opposed the possibility of the ECZ selecting the Dubai printing company, Algurair Printing and Publishing House, alleging that the company had quoted U$$3.6 million for the job, compared to a South African company which quoted US$1.5 million. “There will be no printing of ballot papers from Dubai. We want a free and fair election. There shall be no Dubai ballot papers. I heard what the ECZ said. We heard, but the ECZ must be reminded that if you are colluding with the PF so that you can conduct fraudulent elections, then you will be responsible for what will happen to the country. It is you, and not us. No Dubai,” Mr Hichilema said.